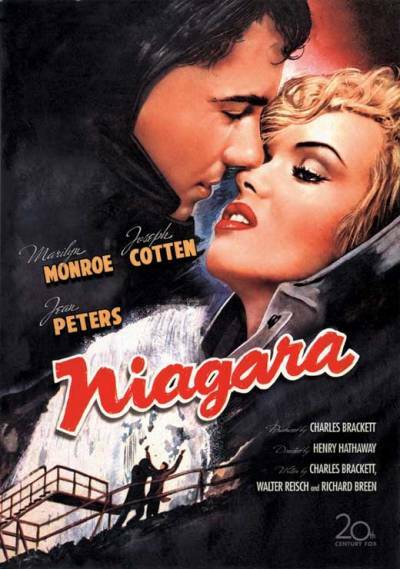 Niagara. 20th Century Fox 1953. According to the box, this is a departure for Marylin Monroe. As opposed to her typical lighter fare, here she’s taking a dark turn as a woman plotting to kill her husband. While I think the term is never used on the cover, this sounds like a noir in the style of Double Indemnity. I’m looking forward to seeing her playing a femme fatale. It seems to suit her more than the giggling, often airheaded bimbo she always plays in her comedies. I know she knew how to control a room with her sexuality, she even built a career on it. I always watch her other movies waiting for her to drop the act and get exactly what she wants because she knows people will give it to her, and that looks like what happens here. Or at least, she tries.